York City striker Craig Farrell has won the FA Cup "Player of the Round" award for the fourth qualifying round. Farrell scored an eight-minute hat-trick towards the end of their 6-0 victory over Rushall Olympic. 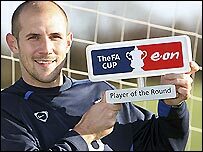 He will join three previous winners - and seven from subsequent rounds - in the "Team of the FA Cup" for 2007/08. The other contenders for the award were Staines goalkeeper Shaun Allaway, Chasetown defender Mark Branch and Ware forward Chris Ellerbeck. The "Team of the FA Cup" so far comprises Jack Pitcher (Gloucester City), Matt Townley (Team Bath), Andy Forbes (Eastleigh) and Farrell.